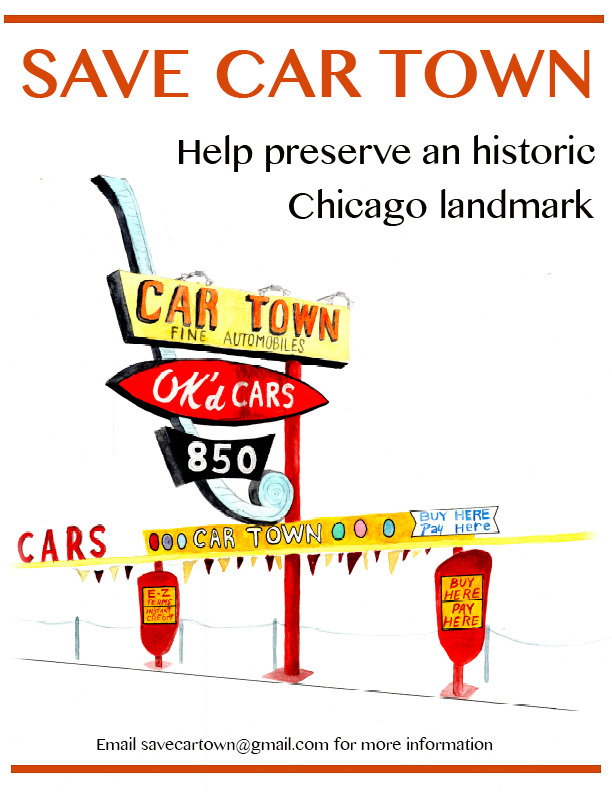 Car Town Inc. is located at 850 N. Western Ave. in Chicago. The current owner established the business in 1986, but based on the design and appearance of the sign it has clearly held a place on Western for many years before that. Western Ave. is the longest street in Chicago and is home to many car dealerships whose giant, eye catching signs and reflective pendant banners loom over the traffic. Across the city of Chicago, and especially in quickly gentrifying/gentrified neighborhoods like the Ukrainian Village, locally owned business are closing to make room for nationwide chain stores and poorly built, architecturally deficient condominiums. This flier, created for Western Pole, exists to preempt the inevitable closing of Car Town and the demolition of the classic sign. It is meant to bring attention to the quickening and devastating loss of architectural history occurring across the City of Chicago in an attempt to preserve this monument of midcentury American consumerism and design.